“The reference Air Force One analog turntable by TechDAS ushers in exquisite design concept to positively exploit the aerodynamic force equivalent to sound energy rather than springs or buffer materials. It is the ultimate mechanism based on a vibration damping design using “Air Force” and utilizes only high-precision finished parts with enough mass to completely avoid any “colour” to the sound, nothing is added or removed. Through the aerodynamic instrumentality of “Air Force” the real magnitude and essence of ultimate analog playback is now a reality. Adverse effects caused by various obstructive oscillations, which used to be arch-nemesis of analog turntables has been thoroughly wiped out by the “Air Force”. Primarily it is important for a turntable to achieve accurate and a noise free stable rotation. As enough inertia is required to get a stable rotation, the turntable platter has to be heavyweight and as stated below, this turntable is a heavyweight one as well. On the other hand however, as the platter load on the bearings is so heavy, a deterioration of the bearings over time may progress and cause frictional vibrations or degradation of rotation accuracies, even with a precision product. To avoid these issues our turntable uses an independent air bearing system that requires no conventional bearing system as such. Equipped with no conventional bearings, our platter is simply installed on the glass plate with a polished flat surface to be aligned with the center shaft for positioning. At this stage, the platter is absolutely still as it is completely connected to the base, but once the ancillary electric air pump starts forcing air into the turntable, you would see the heavy turntable platter floating instantly to the height of 3mm (30μ) above the base and rotating in deep silence and with absolute smoothness. As the platter load is no longer applied anywhere, not only secular changes due to frictional noise or various vibrations are perfectly eliminated, but also the primary performance of highest quality is infinitely maintained. Even though the platter is rotating in an extremely quiet manner and with maximum accuracy, a warped disc set on the platter may cause a vertical motion of a tonearm. Under such circumstance, a high-quality signal pick up is not realized. This can potentially create not only the severest conditions to a cartridge but also any subduction and uplifting of a stylus may cause various factors that could induce large low-frequency signals and damage the fidelity of the source playback. Our vacuum disc suction mechanism in this system provides an efficient solution to those maleficent factors due to the aerodynamic force by “Air Force”. Just one press on the SUCTION button right after setting a disc on the platter holds down the disc while the platter itself is floating. You can see in a split second, as a result, a completely flat disc surface and most of the vertical motion by the tonearm disappears and the potential capability of the cartridge exerts its performance to the full. As a disc becomes one with the platter due to vacuum suction, maleficent sympathetic vibrations are cleared. And moreover, as the disc plate is attracted by means of reducing the atmospheric pressure in the air chamber located internally in the platter, this system enhances damping characteristics of the platter itself, suppress sympathetic vibrations and accordingly signal-to-noise sensitivity improves drastically. After that, a press on the SUCTION button again allows full evacuation instantly enough to release suction of a disc plate at the same time. The third mechanism by aerodynamic “Air Force” is an air suspension system. One of the toughest issues for an analog turntable is how to isolate it from vibrations propagating through floors. There often occurred different vibration problems when a turntable was installed on the floor even when finished with vibro-isolating materials, because vibrations by speakers or people’s movement might propagate through the same floor. To prevent those symptoms in the past, various corrective actions like isolation by springs or buffer materials were applied to many products. In this system again, an air suspension system with the help of aerodynamic force is adopted. Three large-sized feet which support the turntable, internally include air suspensions capable of varying air pressures and enhance the tremendous effect of isolating vibrations. These three pieces of legs accommodate a rotary height adjusting mechanism as well as air suspensions and by controlling them, both level adjustment of the main body and change of damping characteristics become available. Accordingly various sophisticated applications including to realize better playback by means of setting the most suitable damping characteristic to particular cartridge or tonearm in use, are possible. The main chassis is of a tri-laminar structure. The base is constructed using a heavy weight chassis combined with dissimilar materials with a total weight of 43Kg. The main body chassis supported by three large-sized feet which are a composite trilaminar sandwich structure consisted of dissimilar aluminium alloys and it is able to suppress the generation of natural resonance. The thick bottom chassis base is made of magnesium base alloy A5052 having the high strength used in both airplanes and the wheels of automobile together with excellent workability. The middle anodized layer of the chassis above it, is made of zinc-based aluminum alloy A7075, an extra super duralumin often used for airplanes with the highest strength among aluminum alloys. The top layer of the chassis is also made of the aluminum alloy A5052 having the same strength together with excellent workability as the bottom chassis base. This system with the surface coated with hard anodized finishing produces calm beauty. In addition, the total weight of this whole chassis base reaches 43Kg which is capable enough to support any basis of music sound. Two different tonearms such as 10 inch type or 12 inch type can be mounted. As this system is an arm-free designed turntable, no tonearm is incorporated. The chassis described above can accommodate two different tonearms to be mounted on it. Standard tonearms with the effective length of 10 inches can be mounted on the right side of the turntable within standard specifications but also an optionally available arm base for the second tonearm can be installed on the far left of the chassis where a tonearm with the effective length of 12 inches can be mounted. Therefore, both types can be mounted on the turntable. We hope all of you would enjoy various combinations of your favorite tonearms and cartridges to fully enjoy the richness of the analog playback. Since an additional work is required for each mount to meet individual specifications, particular tonearms of your choice should be communicated to us prior to placing your order. The main platter is made of non-magnetic forged stainless steel. There are three different upper platters materials available and you select your preference when placing your order. The turntable platter is custom designed to complement the heavyweight chassis. As stated previously the platter of this system is equipped with a vacuum disc suction mechanism, unlike a simple solid disk it is consisting of a combined main platter with an upper platter having an air chamber with a capacity of 1.1 liter internally. The main platter is made of elaborately forged non-magnetic stainless steel SUS316L in luxury with its outside diameter of 310mm, a height of 54mm and a weight of 19Kg having a 40mm thick perimeter, which generates a large inertia force when rotating. While on the other hand, three kind of upper platters made of three different materials are available and user-selectable to suit an individual favorite sound quality. Please inform us of your choice when placing an order. The available three kinds of platters are made of: extra super duralumin (A7075, weight 4Kg)/ non-magnetic forged stainless steel using the same material as the main platter (SUS316L, weight 11Kg). A very thin ancillary sheet cover using a special material with superior eliminating effect of static electricity is attached to every platter. All three kinds of upper platters are sold separately. We hope you will enjoy finding the distinction of sound quality. Consider these three platters for your own future usage. A fabric belt-drive method is implemented in this system and we believe it to be the best choice. There have been a thread-drive, rubber belt drive, fabric belt-drive and various ways among historical belt-drive methods. In this system as the constant rotation speed by a heavyweight platter should be attained within a short time and should be secured, a non-stretch fiber belt is employed. The material is 4 mm wide polyurethane flat fiber belt with polished surface capable of high smoothness, which is excellent in durability and silence characteristics. 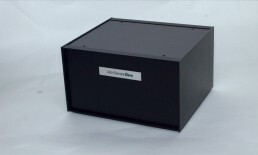 The drive motor is stored in a separate robust aluminum housing installed in a position isolated from the main body chassis.The motor is an AC synchronous motor with a weight of 6.6kg driven by an automatic number-of-revolutions adjustment circuit and a two phase DC amplifier circuit. This automatic number-of-revolutions adjustment circuit can detect every rotational error per revolution through the non-contact sensor installed in the base and correct each error through the automatic adjustment circuit by a microprocessor. When reaching certain constant speed, the circuits are locked which maintains the speed. Simultaneously the voltage of the drive motor is halved and the vibrations from the motor is significantly decreased. The motor then shifts the function to assist the constant rotation of the platter revolving due to inertia to be maintained and not to be stopped. Accordingly incomparable quietness and the very high rotation accuracy are secured. Switching the revolution speed between 33 1/3 rpm and 45 rpm is available and additionally as a maximum 10% pitch control in +- 0.1% steps of each constant speed is possible, the playback with your favorite pitch to suit the discs such as instrumental albums become possible. This system is composed of a turntable main body, an air pump / power supply unit as well as an air condenser unit. In addition to a turntable main body, Air Force One is composed of three units in two separate chassis. 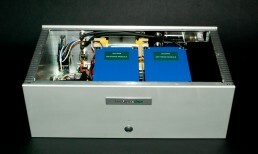 The white larger chassis include a motor-driven air pump unit and a power supply unit. The air pump is a high-performance motor-powered air pump enclosed in a die-cast case and provides incomparable quietness compared to conventional simplified vibration motors and additionally a unique rubber suspension scrupulously eliminates micro vibrations. In addition to the above mechanism, a total of 4 distinct power supplies for a motor driving, a rotation control circuit, an operating circuit and for LED are enclosed in this unit. By each part specialized with a dedicated power supply it is achieved to ensure sufficient power to drive a motor and to enhance the performance of each part. Also by isolating those power supplies from the turntable main body, the electric interference to the music signals transmitted from the cartridge is cancelled and that results in superior playback. In a smaller black chassis, an air condenser is installed, where a tempered glass chamber which is not inflated by the air pressure is enclosed internally and where air evacuated from the air pump is stored and the processed air is fed as well. Due to this mechanism the pulsating air flow is completely absorbed and the air bearings and the disc suction are performed smoothly. Dedicated acrylic damping table is available as an optional item. Since the main unit of Air Force One itself reaches more than 70 kg at least, and the driving motor is separated from the main chassis, it is essential to rest the turntable on an appropriate support, one which has enough strength and stability to allow the deck to give an optimum performance. As previously mentioned, analogue turntables serve as a system that converts mechanical vibration to electrical signals, therefore it is important that the environment where it is placed is able to offer proper support and vibration control. As an option to increase vibration damping in the environment, a damping table made of crystal acrylic which has excellent ability of vibrational absorption is available. This damping table has guide recesses on the top surface for the feet of the main body and the driving motor, so that when placed on the table, the turntable and the motor will maintain correct positioning. The exclusive Damping Table enables Air Force One to exert its performance. An acrylic platter cover to insulate the platter surface from dust is included as a standard item. Needless to say that dust is a great enemy of the analog record. If the disc is put on the platter with dust on the surface, the dust will be embedded deep into the microgroove of the record and may even become hard contaminants. As most turntable suppliers tend to ignore the harmful effects caused by dust, there were only a few examples showing the needs of protection from the dust such as dust covers in the past and almost every supplier currently ignores this issue as can be seen by today’s products. However in the case of covering the whole body with a dust cover, the cover itself may become so large that users may be reluctant to handle it. Therefore, to avoid such problems, a white acrylic platter cover to cover only contact surfaces with the platter is included as a standard item. Optional Items & Accessories Exclusive Damping Table made for Air Force One. Second Tonearm Base and Tonearm Base Wood. Tonearm Base Wood for supplement (for 1st and/or 2nd tonearms). Upper Platter for supplement (A7075/SUS316L/Methacrylate).